This past Friday 200 trail advocates came together at Bend's Unitarian church. 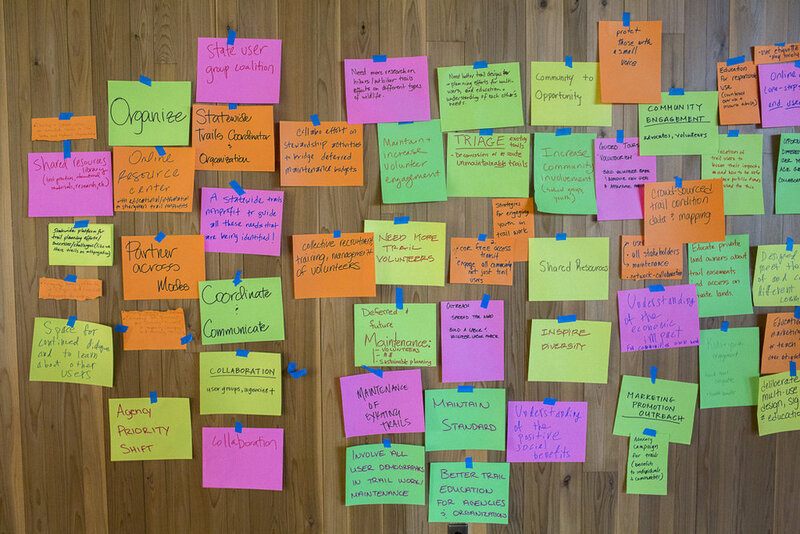 The sun shone bright and the room was full of optimism and desire to collaborate…to organize…to go beyond current practices. We could all agree that we hit the trails in search of adventure. Lauralee Svendsgaard reminded us that because obesity is on the rise, because we have an opioid crisis, because our current administration wants to privatize the world and charge $70 a pop to enter National Parks. We needed to be reminded that this is OUR land to improve and to enjoy. As Keynote speaker, Bill Sullivan, who has authored a dozen guide books (as well as novels) about hiking in Oregon, articulated well, more than ever we need the solitude that nature provides. Bill regaled us with stories of a historic hike across the state from Astoria to Hells Canyon where he pushed his luck through snow storms and encountered a pot-growing survivalist in the middle of nowhere that swore him to silence and threatened him with poison darts! Bill reminded us of the history of mankind that can be discovered on trail, in places like Fort Rock where evidence of the first humans in Oregon have been discovered. Finally we were reminded of the clarity and mental health that can be found in our natural places. Trails are important because they allow us access to these quiet and wild places. Next, Terry Bergeson of Oregon Parks and Rec Dept. spoke about the health benefits of trails. More than ever we need new trails and we need to maintain existing trails. But of course, there is a gap between funding and the work that needs to be done. Oregon’s USFS Trails budget is $19 million of deferred maintenance. The Trump administration is proposing privatizing National Parks. Aren’t parks supposed to be available to everyone, regardless of income? Access is always an important question. How do city dwellers on a limited budget gain access to nature? Do we have good public transportation options to connect to wild spaces? Certainly systems like Mt. Hood Express are a step in that direction, but what about a shuttle system from Portland to the most popular hiking and mountain biking destinations in the gorge? Here is a page from Oregon Hikers.org with links to public transport options. Certainly this could and should expand so more folks can enjoy our local landscape without spending a fortune on gas or clogging our highways with drivers. Scott Bricker from Travel Oregon gave us an update on some new projects. They are helping to develop the Oregon Coast Trail, which is a 372 mile trail, which will be half on beaches, and now currently has some incomplete sections that unfortunately put the user on highway 101. Another interesting project is the Salmonberry Trail, which is a rail trail project that would connect the Banks-Vernonia trail to the coast. It’s an ambitious project, since the trail would have to traverse some wild landscape to reach the coast. For example, a 2007 storm did so much damage to the railway, that they finally determined it wasn’t worth it to repair. While the project is brilliant in concept, I wonder about the maintenance required to maintain trestles and trails over such a changing landscape. Obviously trails like Banks-Vernonia are wildly successful examples of railways converted to paved walking/cycling paths. The Salmonberry Trail is ambitious and we’re excited to follow that project and see where it goes. We got an update on the Historic Highway scenic route that would finally connect Troutdale with The Dalles, without having to ride on 84! Wyeth to Lindsey Creek is under construction now (that section is to be completed in 2019)– you can see their progress as you drive on 84 to Hood River. Apparently ODOT is still raising funds for the Mitchell Point section which includes construction of a new tunnel, so we’ll just have to be patient for now. Kevin Rowell, the Forest Service representative in the Middle Fork Ranger District gave a great presentation about preserving a “backcountry experience” Kevin is fairly unique in that he’s Forest Service, but also mountain bikes. He talked about the work of maintaining 250 miles of mountain bike trails as well as 150 miles of wilderness trails and the struggle to prevent those miles from being lost. He talked about “Wet Weather Operations” using soil saturation data – taking into account for rainfall in the previous 24 hours. He mentioned that tour groups in the area (those that shuttle riders) are the leaders on this, if they find that the ground is overly saturated, they’re supposed to take the day off until conditions improve. In theory, the shops will have that information as well, so a call to the Mercantile would let you know if it’s safe to ride or not on a rainy day. He spoke of the need to train and motivate trail workers. As we mentioned before, there is a gap between what needs to be done and what the Forest Service is able to get done, so we rely on volunteers to get trail work done. Kevin mentioned the new BLM/IMBA “Guidelines for Quality Trail Experience (GQTE) manual and doing trail work on mountain bike trails to this new standard. We were excited to hear Oregon Timber Trail present. They’ve done an excellent job of marketing the trail for Travel Oregon and collaborating with local school kids as well as a University of Oregon class that is studying the trail. Another huge success for the Timber Trail is their work parties and their collaboration with Trans Cascadia to bring up to 50 people to remote locations and multi day work parties. Throughout Friday and Saturday various other trail groups from Bend to Salem, to Klamath Falls, to Roseburg all stood up to give us updates on their efforts. We all realized many common issues and at the same time were inspired that so many great new trail projects are in the works. Almost every group expressed the need for more funding and help with grant proposals. It seems every trail group could use a group of trained volunteers to help maintain their local trails as well as building new trail. The session panel about gender roles and equality was unique in it’s format. Jocelyn Quarrell headed up a panel discussion with Michelle Emmons, Erica Schmid, and Katy Bryce. All of these women are very active in our mountain bike scene as entrepreneurs, teachers, event organizers, authors. I think most would agree that this was one of the most engaging sessions of the whole weekend, since it tackled some sensitive and very timely issues. We got to hear each of their struggles with having to prove themselves in what was a male dominated environment. I heard many men realizing that we have a lot of work to do to create space for all abilities and make our trails more welcoming and inclusive. I think this session was positive in that it was heartfelt and very honest and gave some great insights into a very real struggle, and reminded us that as much as we feel that we’ve done to create a space of equality, we can listen more and we can do more. Here's some more reading about encouraging diversity in the outdoor industry. Dave Wiens came out from Colorado and gave his entire weekend (as did many folks who attended) For many years Dave’s life has revolved around the mountain bike. He has won the Leadville 100 race six (consecutive) times, founded the Gunnison Trails non-profit and current executive director of IMBA. I won’t get into the details of Dave’s talk other than to say that IMBA with Dave at the helm is a different IMBA than in the past and the fact that he spent the entire weekend listening to the state of affairs in Oregon was very encouraging and I believe that Dave is the right man for the job. Many people will question IMBA’s relevancy and wonder how this group is making a difference. What does IMBA bring to the table when all the hard work happens at a local level? Can IMBA be advocates for all of these regional trail groups at a federal level? I was encouraged by Wiens’ words and I believe we have an advocate. It’s up to us to have a dialogue with IMBA and use all of the resources available to us to move things forward. Read more in this BIKE interview with Dave. 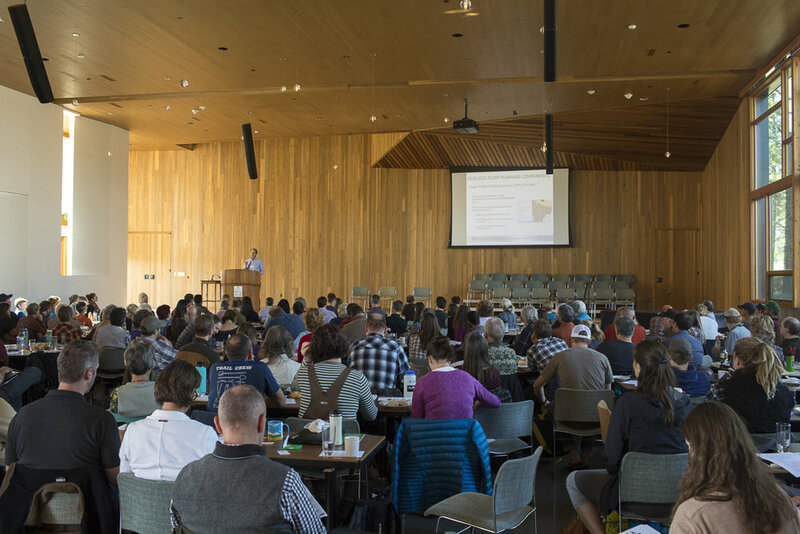 On Sunday a group of representatives from trail groups across Oregon met at the Environmental Center to discuss the possibility of forming a statewide organization that could advocate for all of the regional mountain bike trail groups. Members from GOATS, SATA, COTA, NWTA, Team Dirt, Trans Cascadia, Oregon Timber Trail, were all in attendance. We heard that all of the regional groups need help with funding – knowing what grants are available and effectively writing a grant proposal. All groups need more (well trained) volunteers. Without getting into too much detail, I can tell you that we nominated a group to reconvene and continue the discussion. The challenge is to make sure everyone is well represented and that each groups needs are met. We could all agree that we need a voice at the state and federal level. We need communication between groups – can we share volunteers and coordinate trail parties in a way that doesn’t take volunteers away from a trail party the following weekend. We need more training for volunteers and a way to share tools and best practices. 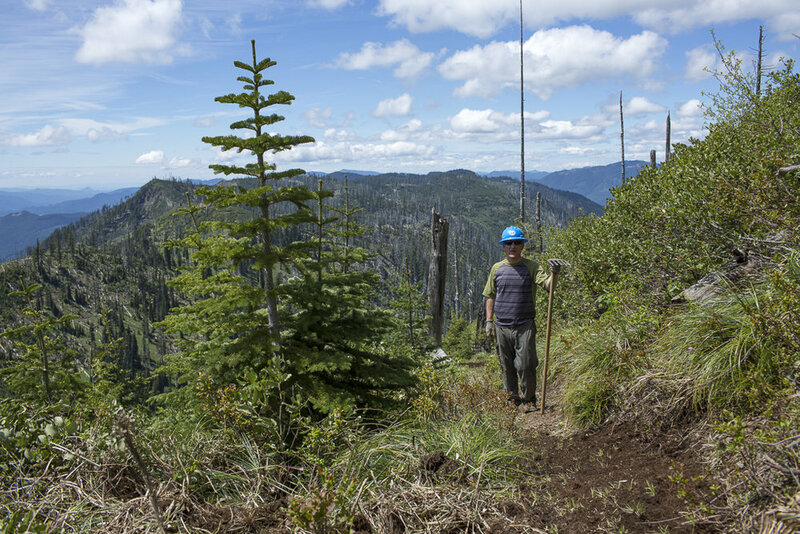 There are many groups like Sierra Buttes Trail stewards or Evergreen Mountain Bike Alliance that set the standard for expanding trail networks and cutting through red tape to get projects built quickly. We agreed that we need to a unified voice to address future proposed Wilderness designations – the risk is losing backcountry trails. While we are unified with hikers and conservationists in the desire to protect natural spaces from corporate interests, like mining and clearcutting timber that would destroy the landscape, we are unique in that we want to keep access to the backcountry trails that are near wilderness. We agreed that we need to be more scientific and prove that mountain bikes do very little actual damage to trails – especially compared to equestrian usage and we need to show that mountain bikers do the work to maintain and repair trails on a regular basis. For several reasons, the time is right for a new wave of trail advocacy. For one, we just had a devastating forest fire season and our beloved gorge is need of repair. There are more and more trail projects that will need volunteer work to maintain. Federal funding for National Parks and Forest Service projects is in danger of being slashed. It’s not a stretch to say that for its physical and mental health America needs its wild places and natural resources now more than ever. My hope is that you’ll do some research, find out how to help improve your local trails, write an email, make a phone call, get some training and lend a hand. We need your passion and your skill with a Macleod. We need motivated advocates and we need you! Let’s keep each other aware of what’s happening both nationally and locally and keep on doing the good work! 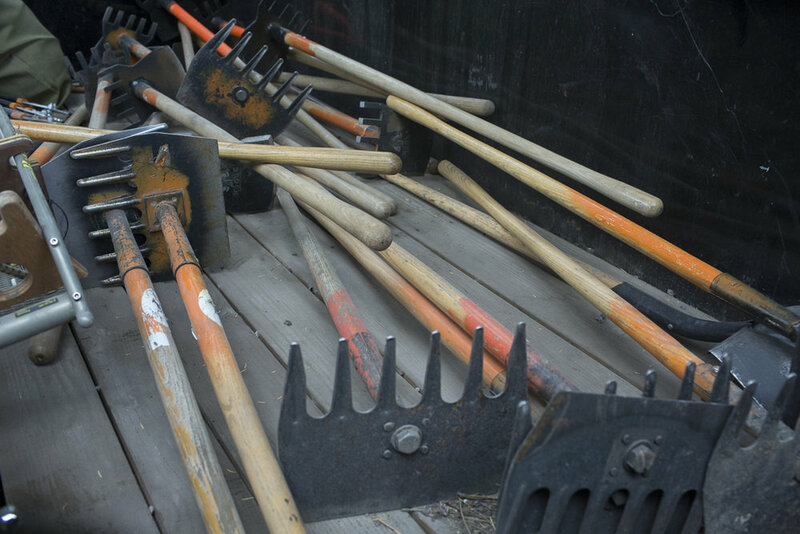 We’ll keep you all posted on upcoming training for trail work. Right now, we know that High Cascade Forest Volunteers offer free training. Oregon Timber Trail led a first aid and sawyer’s training. Go to their site and sign up for updates on educational opportunities. They will have several stewardship events in several different tiers in 2018. NWTA does work parties at Gateway Green and Sandy Ridge. Stop in at Velocult for one of their monthly meetings and see what they have going on. They have interesting speakers and it’s a great way to get to know your fellow mountain bike community.